Sorry, I got a little confused with my title because of all the Italy reasearch and planning I have been doing the last week or so. 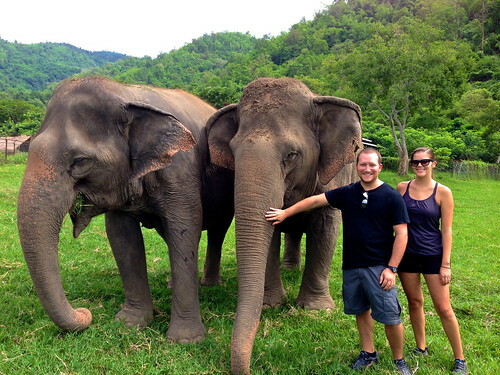 This picture was actually taken at the Elephant Nature Park just north of Chiang Mai, Thailand. I’ll have a whole post about it soon, but for now you can enjoy this little gem we took with Jokia and Mae Perm. Jokia is blind after being abused by her prior owners, but luckily she was rescued and found her best friend Mae Perm who never leaves her side and acts as her eyes to the park. They were the first of many elephants we got the chance to meet, learn about, bathe, feed, and play with at the park. More pics and stories to come. Yup, you heard correctly! We’re heading out of South East Asia and into Europe! A few weeks ago I teased a little insight as to where we would be off to next on our HeyNoobz Facebook page (are you a fan?). Well, here is the big reveal! In just 3 days we will be arriving at Fiumicino Airport in Rome, Italy. I’m so excited to officially start the Europe part of our trip! Instead of pad thai, we will be devouring cheese and bread and wine like it’s no ones business. Don’t get me wrong, I am going to miss the pad thai. I’m also going to miss the prices of that pad thai, the hotels, and everything else that has been so darn cheap here in SEA. But most of all, we’re going to miss Chiang Mai a whole lot. We have met so many great friends here, been on so many awesome adventures (hello, Mr. Elephant! ), eaten so much great food, and just had the time of our lives in this little city we got to call home for a little while. We’ll definitely be back someday. So, we’re packing up our bags and getting back on the road. I have all the nervous/excited butterflies! Have any Italy, France, Greece tips? Please share them! Those are just the 3 countries we know for sure we’re heading to so far, but if you have any other Europe tips or must sees, do tell!